Kelsenian law is then a subset of the set of norms, specifically, norms given validity by a Grundnorm that are effective and prescribe sanctions. Today I’m going to try to fit other definitions of law into the diagram. This will raise lots of questions that I want to look into further. In his book The Concept of Physical Law, Norman Swartz makes a distinction between ‘scientific law’ and ‘physical law.’ Scientific Laws are laws like Newton’s Laws and Ohm’s Law; they are posited by humans and can be changed or created at will. Physical Laws exist ‘out there’ and actually correspond to reality – they are the true laws, and are independent of our understanding. One could argue then, that the goal of science is to successfully approximate the physical laws with the right set of scientific laws. It is an open philosophical question as to whether the physical laws actually exist. I won’t go into this now, but it may be the topic of another post. These sit inside ‘Descriptive Statements,’ and physical laws are a subset of ‘scientific laws’ that are true. The question of what ‘true’ means is a discipline in philosophy, but I’ll see if I can learn at least something about it. The theory of natural law claims that within the set of norms there is a subset of objectively correct laws. A society’s positive law is an approximation of the natural law, and improvements to positive law bring it closer to natural law. 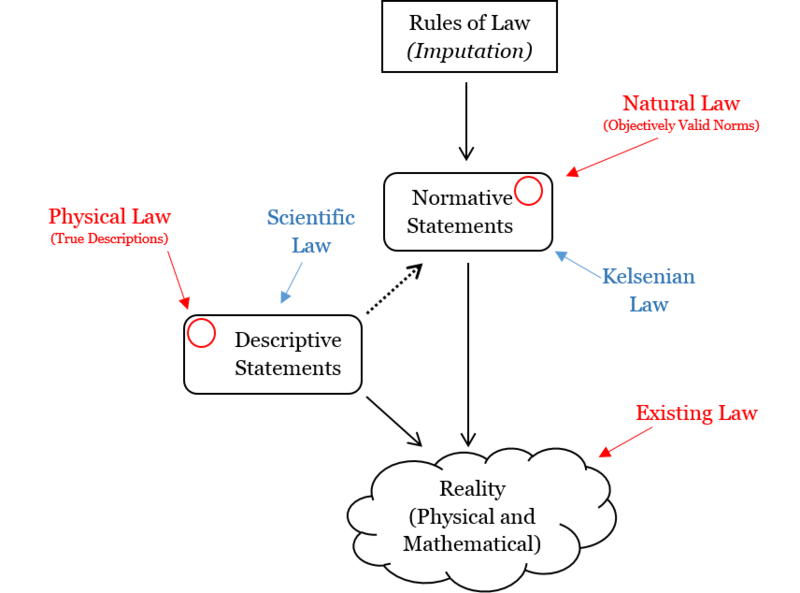 Natural law is a bit like physical law then, in that our positive law (scientific or Kelsenian) is an approximation for the ‘true’ law (physical or natural). 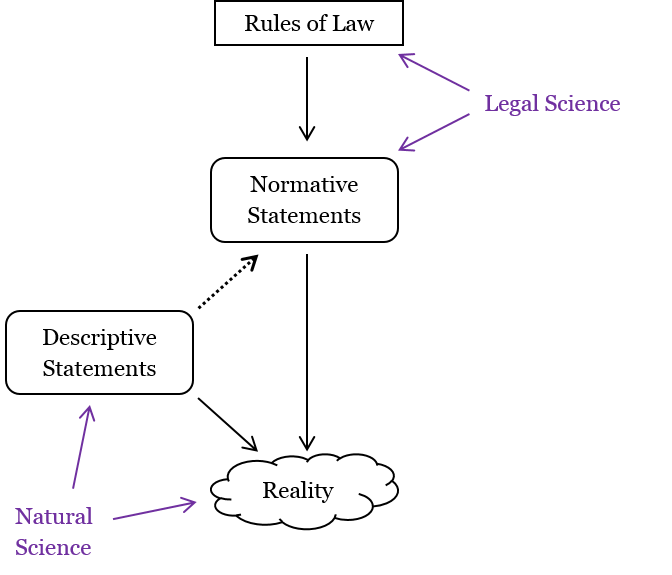 Natural law then fits into Kelsen’s scheme as a special subset of normative statements that are objectively valid. The Pure Theory argues that by definition natural law cannot exist – a law can only derive validity from a presupposed Grundnorm, therefore and no law can be objectively correct. I don’t know how a natural lawyer would get around that argument, so that’s another thing to look into. So far we have talked about physical law as objectively true rules, or natural law as objectively valid norms. You can go one step further, and argue that these laws actually exist in reality somewhere. This would give you statements like “The law of gravity causes the mass to accelerate.” I will call these laws that exist in reality ‘Existing Law.’ They just go into the ‘Reality’ spot in Kelsen’s scheme. This theory sits comfortably with the idea of a God, who exists in reality and creates the physical and natural laws. Note that this of course does not need to be the Christian God, or any other particular God – for example, Einstein’s ‘cosmic spirituality’ fits this description. A more secular interpretation of this could nonetheless describe laws as objects that exist, and can affect matter. A natural lawyer could describe norms as arising from ‘human nature,’ which fits into the language of ‘fundamental human rights’ and other such things. I haven’t read anything that argues for existing law yet, and this is another thing that deserves its own post. Where do maths and logic fit into the diagram? Is the statement ‘there are infinitely many primes’ a descriptive statement? Mathematical reality would then apply to rules of law and rules of science, because the various techniques to derive new norms/descriptions would come from maths and logic. This is interesting, because now the diagram is asymmetrical: legal laws live in set of normative statements, but scientific laws don’t live in the set of descriptive statements – they live above it, in the set of rules governing those statements. Is this diagram misleading us? Or is it saying something important about the difference between these two kinds of law? Do physical laws exist? What are some definitions of physical laws? One answer is Regularity Theory, which I talk about here. Does natural law exist? How do natural lawyers justify the existence of natural law? What arguments are there to think that laws exist in reality? Just wanted to say that this really helped me out with a course in understanding scientific reasoning in Kelsen’s pure theory of law!